With the exception of the Italians, who border on the fetishistic relative to the fit of their dress shirts, most men wear theirs too tight in the neck, too short in the sleeve, and too full around the wrist. The explanation for this is relatively simple: successive washings shrink the collar size and sleeve length, while most manufacturers allow enough cuff width for a large Rolex-sized watch to drive through. Unless its collar fits comfortably, the best dress shirt is useless. With the top button closed, two fingers should be able to slide comfortably between the neck and the collar of a new shirt. Most fine shirt makes add an extra half-inch to the stated collar size to allow for shrink age during the first several washings. Should the collar of a new dress shirt fit to perfection when first tried on, return it or risk being strangled before too long. As the torso’s second skin, the shirt should fit comfortably. At a minimum, it should be cut full enough to allow the wearer to sit without concern of whether its front will gape open. Even normal shrinkage or weight gain should not create tension across the chest or waist. When a necktie is worn, the collar’s points ought to be able to remain in touch with a shirt’s body, no matter how the wearer turns his head. Semi- spread to cutaway collars should have no tie space above the tie’s knot, with points long enough to be covered by the jacket’s neckline. And finally, no part of the collar’s neckband should peek out over the tie’s knot. 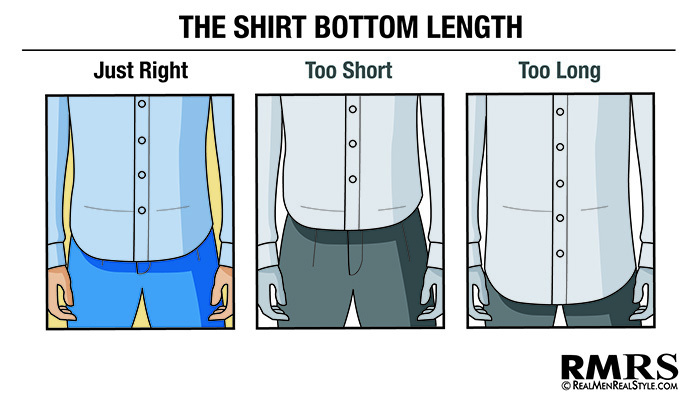 The shirt length should end a few inches below the beltline. This way the shirt stays tucked in when you raise your arms. When untucked, it should be long enough to cover your belt. The shirt’s shoulder point should fall perfectly at the edge of your shoulders. When this is not the case, it will make your upper body look bigger or it will make the shoulder points stand up and move towards the neck when raising your arms. The length of the sleeve should be so that it comes down to the large wrist bones. This way the shirt covers a watch when you choose to wear one. When you are wearing a jacket, about ½ to 1 inch of shirt cuff should be visible beyond the end of the jacket sleeve. Next to the length of the sleeve, the width of the sleeve is important. There should be some looseness when the arms are hanging and should be slightly wider at the upper arm. Whether barrel or French cuff, the shirt must fit snugly around the wrist so that the additional length required to keep the cuff from pulling back when the arm is extended does not force it down the hand. Shirt cuff and hand should move as one. If the hand can slide through the cuff opening without first unfastening it, the cuff’s circumference is too large.